Avocado - The fruit of the Kings ! Sitting on a bar stool sipping the chilled dirty martini, so drained, dog-tired from the day, you are trying to avoid a steady gaze of extremely handsome jaw dropping guy... Only thinking I wish I had eaten that extra piece of avocado in the morning. For the Aztecs, avocado was, "the fruit of the kings" and eaten as a luxurious aphrodisiac. The Aztecs also believed that avocado was the fertility fruit. Among the twenty top fruits it ranks highest in lutein, vitamin E, glutathione, beta-sitosterol, folacin, fiber, potassium, and magnesium. Avocados act as a "nutrient booster" by enabling the body to absorb more fat-soluble nutrients, such as alpha and beta-carotene and lutein in foods that are eaten with it. It is good source of vitamin K, dietary fiber, vitamin B6, vitamin C, folate, copper, and contain more potassium than a medium banana. An avocado contains 877 grams of potassium vs. a banana has 470 grams and avocado has much less sugar! Sooooo much FAT ??? But Good kind. Avocados have fat content between 71 to 88% of their total calories, which is about 20 times the average for other fruits. A typical avocado contains 30 grams of fat but 20 grams of these fat are health-promoting monounsaturated fats, especially oleic acid. Thus single 30 gram serving of avocado is better than any other popular snack. It is recommended to eat up to two servings (2 ounces) or 100-calories worth of avocados per day, which can help you meet your recommended daily fruit intake. 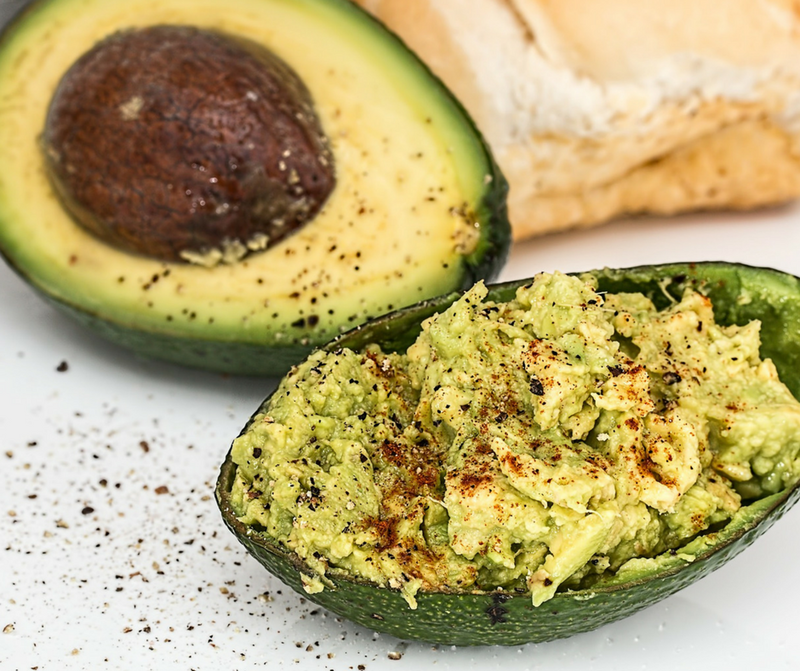 Due to the avocado's mono and polyunsaturated fat content, they're a great substitution for foods rich in saturated fat. They improve cardiovascular health, help in blood sugar regulation. It has anti-cancer and anti-inflammatory benefits. Which one is right one? A ripe, ready-to-eat avocado is slightly soft but should have no dark sunken spots or cracks. A firm avocado will ripen at room temperature within few days. As the fruit ripens, the skin will turn darker. Avocados should not be refrigerated until they are ripe. Once ripe, they can be kept refrigerated for up to a week. Sprinkling the exposed surface(s) with lemon juice will help to prevent the browning. Research has shown that the greatest concentration of carotenoids in avocado occurs in the dark green flesh that lies just beneath the skin. You don't want to slice into that dark green portion any more than necessary when you are peeling an avocado. Apart from adding avocados to sandwiches and salads or making popular guacamole, you can make Avocado shake and other recipes.